assistance: home, legal, medical, road. Across all 286 brands researched, at least one insurance or assistance policy was on offer from 159 (55.6%) of them and Finaccord identified 440 distinct product initiatives in total with providers including organisations such as ACE, AIG, Allianz Global Assistance, American Assist, Assurant, Asurion, AXA, Iké Asistencia, MAPFRE, Marsh, Tokio Marine & Nichido and Zurich. 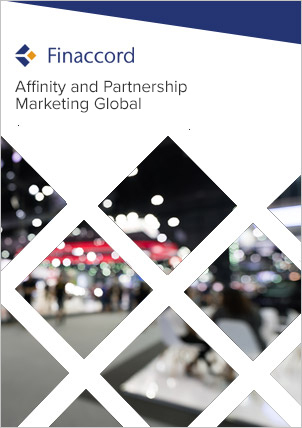 The often vast number of customers of mobile operator brands, typically running into millions or tens of millions, makes them potentially attractive as affinity partners to insurance and assistance companies. Moreover, rapid growth in the worldwide market for mobile payments signifies that there are increasing opportunities to combine insurance and assistance policies with emerging payment products. availability of an accompanying interactive PartnerBASE database that details the 440 distinct product initiatives and that is fully customisable, searchable and filterable, enabling provision and distribution patterns to be explored across multiple brands, parent groups and geographical regions. For further information about this research, please access the table of contents and series prospectus by clicking on the corresponding links above, or e-mail info@finaccord.com.